THOS. FRANCIS (No: 18035) was born in Montgomery, and was living in Craven Arms when he enlisted in Shrewsbury in the KSLI. 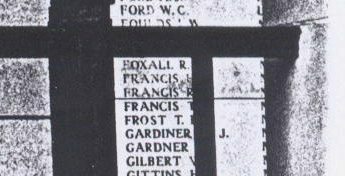 His brother William Orlando Francis, (No: 18036), served with him, doubtless enlisted with him, and died in the same action whilst serving with him in the 7th Battalion, but is not named on Cardington's War Memorial. They were farmer sons of Mr & Mrs Francis of Lawton, Stanton Lacey, and had other brothers serving in the Army. Thos Francis was killed in action on 3 April 1916; William Orlando Francis had died of wounds the day before, 2 April. 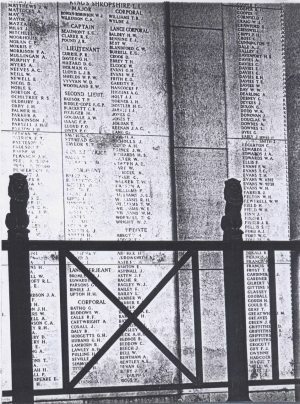 Pte Thomas Francis' name is inscribed in the right hand column on the Menin Gate Memorial at Ypres. His brother's name is not listed in the KSLI section there. Also see Wellington & Shrewsbury Journal 22 April 1916 and 5 April 1919.